SBC API for Facebook could be used instead of official native Facebook API. 2. Facebook Pages (all kinds). 3. Public Groups. User should be at least a member of the group. 4. Closed Groups. User should be at least a member of the group. 5. Secret Groups. User should be at least a member of the group. ***Facebook Premium API for WordPress requires SBC WordPress plugin version 4.2.7 or later. If your server is located too far from your regular Facebook login location, facebook may find your new login suspicious. This is why we have two different ways of authorization. If Facebook finds login with username/password suspicious, please try session or if you got “Location Block” from session usage, please try username/password. I got message from Facebook saying “Your account was accessed from some remote location”, was that you? All our scripts are installed on your server and your server makes posts to your networks directly. When you make a post your server logins to your account on your behalf and makes a post. The location in the email that your account was accessed from is a location of your server. Please confirm that it was you. It might take several times and then Facebook will stop asking. Alternatively please try to use session instead of username/password or vise versa. 1.1. 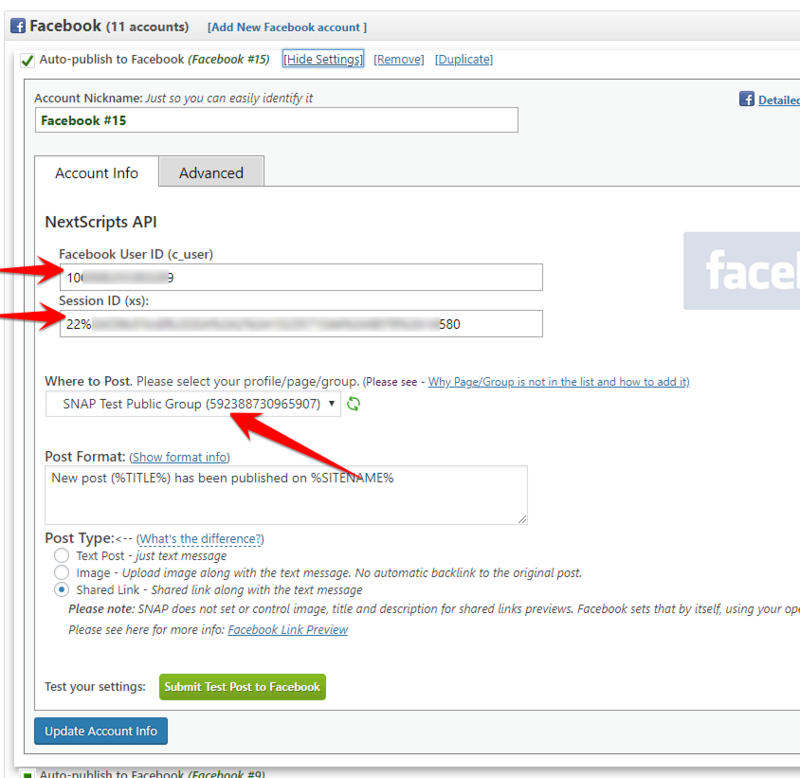 Login to your WordPress Admin Panel, Go to the Settings->Social Networks AutoPoster Options. 1.2. Click green “Add new account” button, select “Facebook” from the list. 1.3. Select NexctScripts API from the dropdown. 1.6. Click [Add Account] 1.7. Find your new account in the list and click [Show Settings]. Notice new “Where to Post” dropdown showing your profile, pages and groups. Select one of the pages or groups and click “Update Account Info”. 2.1. 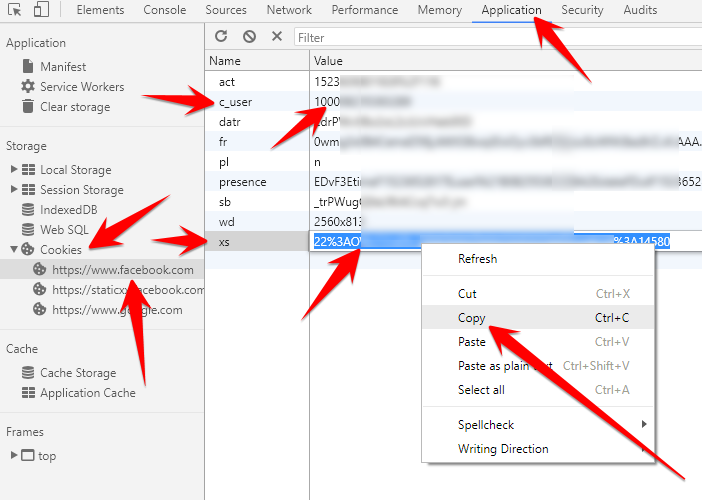 Open new "Incognito" (Chrome), "Private" (Firefox) or "InPrivate" (MS Edge) window and login to your Facebook account. 2.2. Open Development console. Press F12 or do a right-click and select "Inspect" or "Inspect Element" from the menu. 2.3. Open a tab with stored page items. That tab called "Storage" in Firefox, "Application" in Chrome and "Debugger" in MS Edge. 2.4. Click on "Cookies", then on "https://www.facebook.com/"
2.5. Find a cookie with the name "c_user". Double click on the value and copy it. 2.6. Paste c_user value to the "Facebook User ID (c_user)" field in the plugin. 2.5. Find a cookie with the name "xs". Double click on the value and copy it. 2.6. Paste xs value to the "Session ID (xs)" field in the plugin. 2.7. Close that Incognito/Private/InPrivate window. 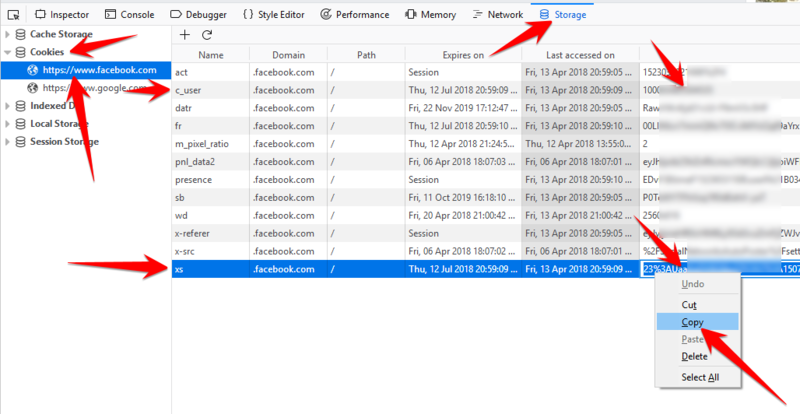 [VERY Important] Please DO NOT logout from Facebook before closing that window. 2.8. Plugin will retreive the list of your pages and groups. Please select your profile, page or group from the list or enter the custom page/group ID or URL. 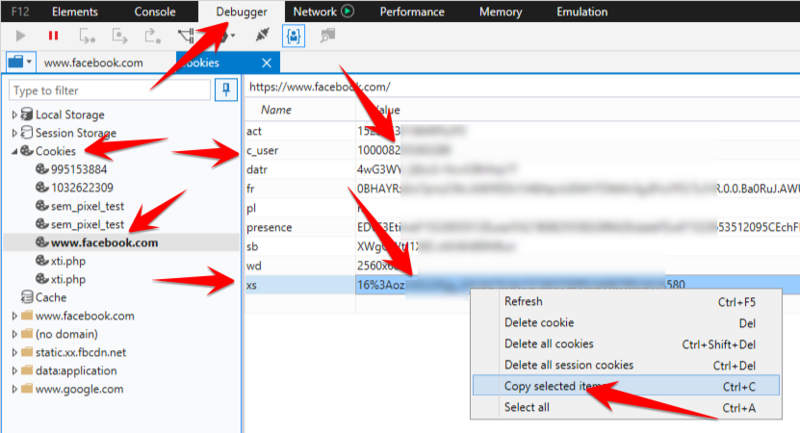 [VERY Important] Please DO NOT logout from Facebook in the browser where you got the session. You can close the browser, but don't click "Logout" button. Logout will destroy the session and autoposting will stop working. You will need to get a new session ID if you logout. If you need to set several different accounts, you can open an "Incognito" window in your browser, login, get a session ID and close the window. Then you can open another "Incognito" window for the next account. Just don't ever click "logout" button. $ValueFromTheCookie must contain the "xs" value that you got from the instructions above. $ValueFromTheUserIDCookie must contain the "c_name" value that you got from the instructions above.